Whether we like it or not, but the owners of private houses constantly have to deal with the need to maintain stoves, fireplaces and heating boilers running on liquid or solid fuel. The need for this arises due to the fact that during the combustion of fuel soot is released, which settles on the walls of chimney pipes and channels. If it is not cleaned, then over time it will clog the channel so much that the heater will not work effectively. Often, soot can even ignite inside the channel, which can cause a fire. At best, “only” chimney walls will wear out faster. So, why this procedure needs to be carried out, we figured it out, now consider how to clean the chimney pipe their own hands with high quality and observing safety. Various debris, as well as plastic bottles, do not need to be burned in a furnace. Plywood and particleboard not only burn badly, but also emit substances that contribute to the formation of soot, since the binding component of these materials is glue. 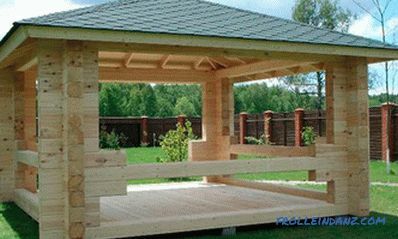 Coniferous firewood contains a lot of tar, and since the combustion temperature of such a material is very low, all tar will remain on the walls of the chimney. Raw firewood is a bad choice, and if they are made from softwood, it is unlikely that you will be able to come up with something worse. Soot is formed at an insufficient temperature of combustion of the fuel and if there is not enough oxygen. Soot is formed during incomplete combustion of fuel. Therefore, the more efficiently the fuel burns, the less soot is formed. If you have a long-burning metallic furnace, then there will always be a lot of soot in it. In addition to the negative effects caused by soot formation, there is a less noticeable functional effect - gradually, almost imperceptibly, the furnace begins to heat less. To understand how well (or badly) fuel burns, it is enough to pay attention to the color of the smoke coming out of the pipe: the blacker it is, the more soot it has. You figured out the possible causes, but this didn’t make the draft in the radiator better, so consider how to clean the chimney. Faced with a problem, many people are searching, trying to figure out how to clean their chimney. Immediately a little upset, noting that until now a universal remedy, such as "by magic, according to my desire ..." - was not invented. Because of this, the cleaning of each chimney in a private house must be approached individually, choosing the appropriate tool or method. Chimney ducts can be cleaned of soot by folk remedies. Use of rock salt for chimney cleaning is the cheapest way, but by no means very effective. Radically clean the pipe does not work, so this technology can be attributed to preventive measures that prevent the accumulation of soot inside the chimney channels. 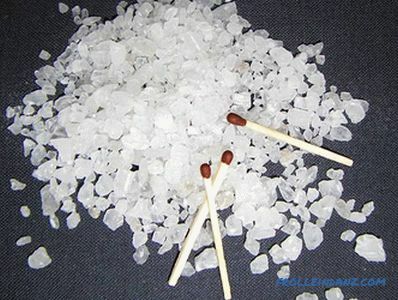 Method of application: In the process of burning wood or coal, a pile of salt is simply poured into the oven. Every home has potato peels that can be used to advantage by burning in the oven. During the combustion of the cleanings, steam is formed, saturated with starch, which, passing through the chimney along with the smoke, softens soot well, and part of it flies out of the chimney. 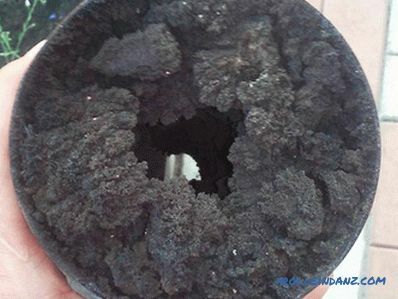 The softened soot remaining in the pipe is removed mechanically. Consumption of such funds is governed by the size of the furnace, but, on average, the volume is 1 bucket. Method of application: Potato husks or sliced ​​potatoes are poured on hot coals - everything should burn out. Reasonably efficient, but also a peculiar remedy, since the cleaning is carried out by creating a high temperature inside the chimney channel, as a result of which the soot burns out. 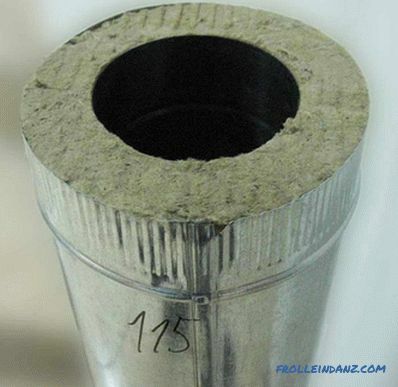 It is recommended for use only for capital furnaces with a solid, not too clogged soot chimney. Method of use: Several armfuls of aspen wood are simply burnt in the furnace. There are both domestic and imported chemicals for chimney cleaning - these can be briquettes or powders packaged in sachets. Czech Cominichek can be purchased on the market . In a pack there are 5 bags. The mass of each of them is 14 grams. The tool is not very powerful and is designed to remove a specific layer of carbon black with a thickness of not more than 2 mm. During combustion, this preparation reacts with soot, as a result of which it turns into oxide, which burns without fire, due to the high temperature created in the flue duct. Method of application: 1 bag of tools is thrown into the burning furnace and the door closes tightly. Packaging is designed to be consumed within 90 days. This briquette really resembles a 25 cm log (there is a shorter “log” for small ovens and stoop A very effective tool for cleaning chimneys of any type, even complex construction. When the drug is burned, light chemicals are released, which soften the soot so much that it falls off from the walls of the canals and chimneys. Reviews on the use of logs are the most controversial, but in any case, the use of this drug will not replace a periodic mechanical cleaning. 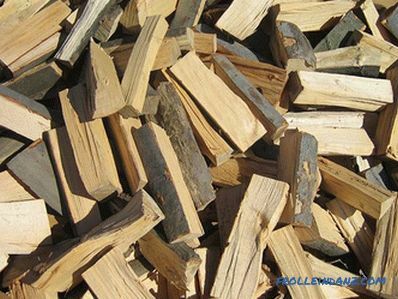 Method of application: Although the log can be burned without other fuels, the best effect is achieved if the product is placed on hot coals. Instructions for use of the drug can be found on the original packaging in which it is sold, but the essence boils down to one thing - to burn. This tool is available in the form of a box or log. Also, manufacturers have established the production of granulated cleaner, designed to combat pollution in pellet boilers and furnaces. How to use: Cleaning is done every two months by burning the product. 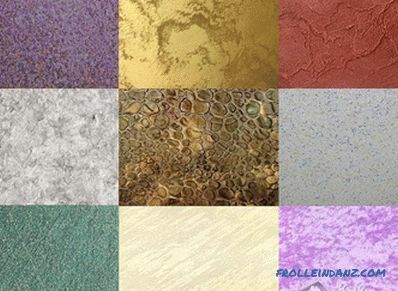 When used in a pellet boiler, a mixture is used, the ratio of which is 1 kg of agent per 100 kg of fuel. The anti-joint chemical composition (PCC) is called a powdery means for cleaning chimney ducts. Its use is characterized by the need for accurate dosage - the powder consumption is only 150–200 grams per 1 ton of fuel. With constant use of the oven, cleaning is done once every 2 months, in other cases it is enough to burn the bag of the product every six months. How to use: A bag of powder is put into the firebox and burned with or without fuel. When choosing a chemical product to clean the chimney and furnace from soot, first read the instructions. In addition, you need to take into account the manufacturer's recommendations as to which boilers or furnaces it is intended for. No matter how desirable, but there will come a time when mechanical cleaning is indispensable. 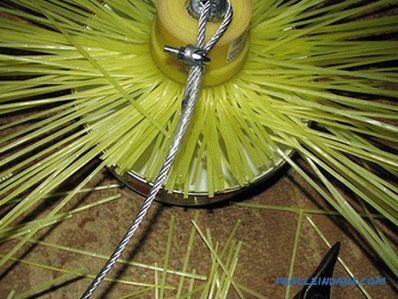 If you have to do this procedure yourself, you will need to purchase or manufacture a special tool. Cleaning Process The chimney inside the room is simple, and how to do it was clearly shown in the video. In some cases, cleaning is only possible from above, and many people consider this as the only option because they do not want to litter the room. Most often, the chimney rises above the pitched roof, which makes work on it not only inconvenient, but also unsafe. This is a good reason to adhere to strict safety practices. If it is raining / snowing or a strong wind is blowing, then for the sake of your safety it is better to postpone cleaning to a more convenient occasion. First of all tightly close the door and all cleaning holes to prevent soot from entering the room. If it is necessary to clean a fireplace that is not equipped with a door, then the firebox must be closed as thoroughly as possible. To do this, you can glue a piece of plastic film onto the furnace with masking tape or, in extreme cases, curtain with a damp, dense cloth. In addition, a piece of compacted soot that has fallen out of the pipe may violate such protection, so it is worth backing it up with a shield. Some people put sandboxes in the furnace hole. We climb to the roof using insurance. When you get to the chimney, check to see if there is any debris inside the nest. If you find something, then remove or push the stick down (if the channel is straight). Assess the degree of contamination and its composition - if there are strong pitch deposits on the walls, then a tool designed for cleaning soot will not work. Having decided on a suitable tool, proceed to the cleaning. If the soot layer is quite dense in the channel, it must first be cleaned with a scraper. When the need for such cleaning does not occur, you can do the removal of soot directly using a prepared tool. In cases where preventive work is performed extremely rarely, a congestion may occur in the channel, which can be compacted into dense pieces of soot that have fallen down during cleaning. In this case, it is necessary to pierce this plug with the help of a nucleus - a heavy metal ball fixed on the cable. He should try to throw in the center of the channel, if possible without touching the walls of the pipe. This should be done until the congestion is broken. If you use a weight instead of a core, it can be skewed, and it is firmly stuck in the channel. To get her have to disassemble the chimney. In principle, at home it is quite realistic to clean the chimney from the resin, only you need to strictly follow the recommendations. It remains to clean up the garbage, restore order and, without fear, wait for the start of the heating season. 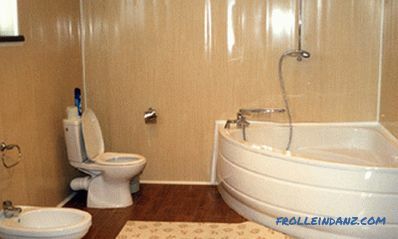 However, furnaces do not use only in a residential building, but also in a bath. Recently, the chimney is often collected from low-quality sandwich pipes, which are not sufficiently insulated, therefore condensate is formed abundantly inside them, and it, when mixed with soot, forms a tar material. Also, one should not forget that the type of fuel influences the formation of soot, but if this is all right, cleaning the chimney from a sandwich pipe will not become a tedious task. 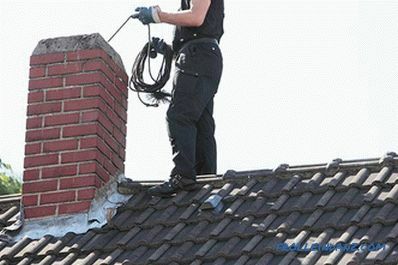 The principle of cleaning a chimney from a sandwich pipe does not change depending on where the chimney is operating - in private house or bath.